This No Fail Roast Rack of Lamb Recipe couldn’t be any easier. 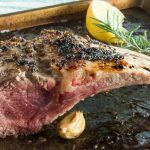 It yields a tender juicy bite with the perfect seared crust in about 30 minutes for ideal entertaining! Sometimes I want to make something a little bit more than chicken or steak for a nice dinner with friends. 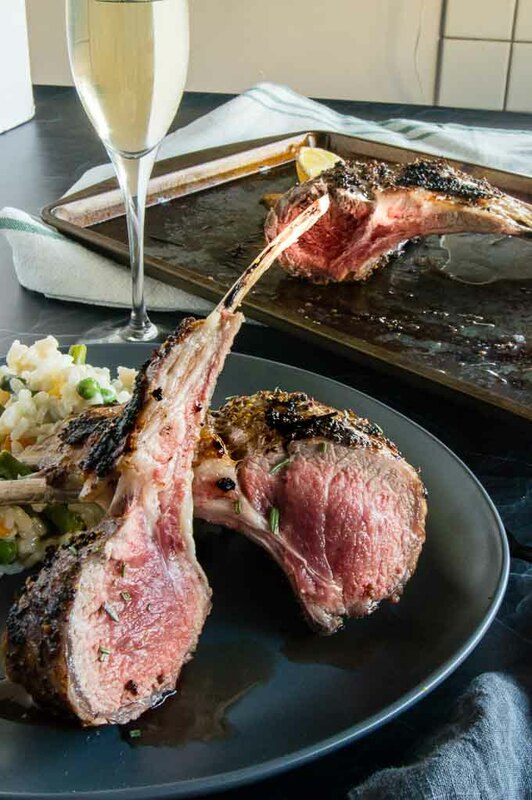 We really enjoy grilling lamb like these Easy Grilled Chops but if I need something a wee bit more special I’ll make this Roast Rack Of Lamb Recipe for the simple reason it is so easy to make that there is no way to mess it up. This rack of lamb has the best flavor. The edges are seared and give a nice depth to the taste. 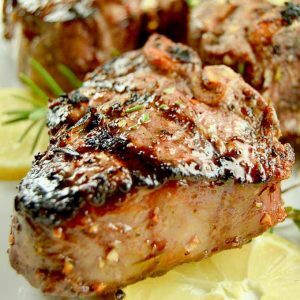 The seasonings (mustard, rosemary and salt) add a brightness to the lamb and its cooked in such a way that when its done its still juicy and tender. 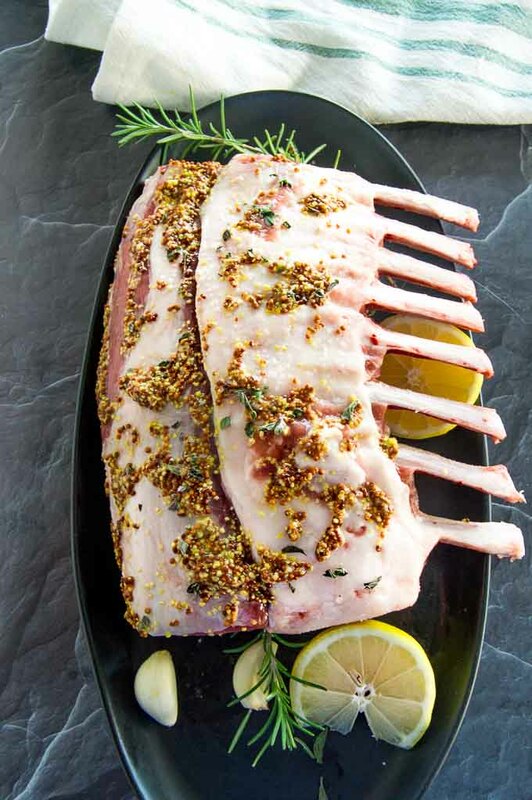 What is the easiest way for Cooking Rack of Lamb? Rinse and pat dry the rack of lamb. I buy my lamb at Costco and the bones come pretty clean, but if you need a tutorial on how to French the bones there is a really good one here to see if you want to do it yourself. You can also ask the butcher to do it for you. Using just a few ingredients you will coat all the edges of the meat. Roast the lamb to 5°-10° shy of your desired doneness. (the lamb will continue to cook both in the reverse searing process and while it rests. I reverse sear the meat meaning I roast the rack of lamb in the oven first, then once cooked to almost done I then sear it in a pan on the stove top. 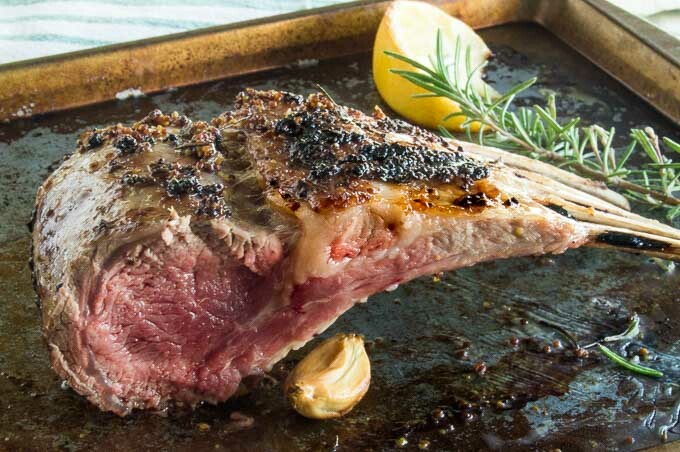 The advantage to reverse searing is that when roasting at the high temperature the fat doesn’t get overly burnt. By searing it afterwards you can control the amount of browning on the edges. 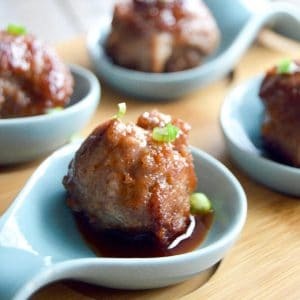 Looking for More Special Occasion Meals for Entertaining? This No Fail Roast Rack of Lamb Recipe couldn't be any easier. 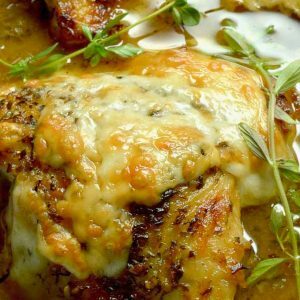 It yields a tender juicy bite with the perfect seared crust in about 30 minutes for ideal entertaining! Rinse and pat dry each rack of lamb. Cut the garlic in half and rub garlic over all areas of meat and fat. Into a small bowl mix rosemary and mustard and stir to combine well. Sprinkle generously lamb with salt and pepper making sure to get all areas. Take mustard mixture and rub all over lamb meat/fat keeping exposed bones clean. Place lamb racks fat side up on a roasting pan. Lay extra sprigs of rosemary on the pan next to lamb to be able to release the scents as cooking. Place in oven and roast for 20 minutes for rare, 22 for medium rare and 26 for medium well. (I always usa an instant read thermometer to check desired doneness.). All ovens are slightly different but you will remove the lab 5 degrees before your final desired doneness. See chart in the notes. Heat a skillet to high. 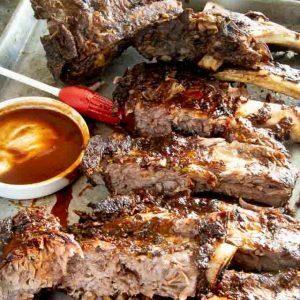 One rack at a time, you will sear the edges of the lamb to a dark golden brown color. Make sure to sear all meat sides. About 1 minute per side. Allow rack to rest for 10 minutes. Cut to chops, leaving 2 bones in each slice. Serve immediately. I have to give this a try! What an amazing way to make lamb! Such a lovely meal!! Lamb isn’t something I have ever made. I need to change that!! The reverse sear technique is so smart! That is new to me but it really makes sense. Ending up with this perfect seared lamb makes this a must-try, what a lovely meal!!! I never heard of reverse searing! I can’t wait to try it. When I sear my pork roast and then cook it in the oven the ends get really dry and now I know how to fix it! Don’t think I am not going to try this lamb that way too!! Agree ! Perfect to make a change and surprise people at gatherings ! Thank you so much ! I LOVE rack of lamb. It sounds strange to say that because I didn’t used to. If it’s good and fresh, it’s amazing! Just like this looks; amazing! I don’t know why we don’t eat more lamb! This rack is just gorgeous and I’m drooling! Wow! That rack of lamb looks spectacular. I am salivating while commenting. Simple ingredients and such an easy process. Definitely a show stopper for when one has company and a quick meal for any day of the week.